Swish Barrel Storing and Cleaning Tablets are pre-measured doses of sulfates formulated to kill bacteria and inhibit the growth of yeast and microbes in the barrel. When storing or cleaning your barrel between uses, dissolve the appropriate number of tablets in water. 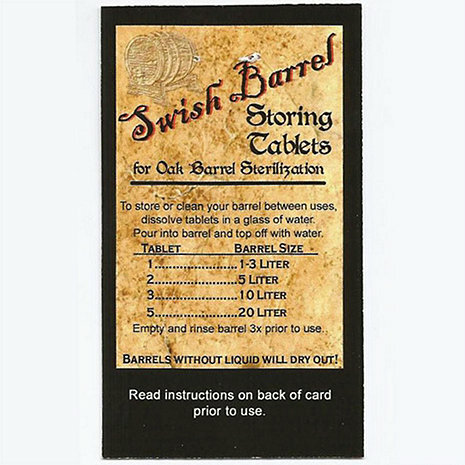 Swish Barrel Storing and Cleaning Tablets are pre-measured doses of sulfates formulated to kill bacteria and inhibit the growth of yeast and microbes in the barrel. When storing or cleaning your barrel between uses, dissolve the appropriate number of tablets in water. Pour mixture in the barrel and fill completely with additional water. Store in cool damp conditions if possible. Rinse 3x prior to use. Sanitize your barrel with a Swish Barrel Cleaning Kit after 2 or 3 uses. To store or clean your barrel between uses, dissolve tablets in a glass of water. Pour into barrel and top off with water. 1 tablet is needed for each 1-3 liter barrel. Empty and rinse barrel 3x prior to use. So, these 5 barrels come in 5 different sizes and are all USABLE? as in, storing beer/wine in it? BEST ANSWER: Thank you for your inquiry. Yes, all 5 barrels can be used for storing beer and wine. if you have any furthe questions, feel free to reach out to us at 800 356 8466. Thank you again. Yes all can be used for storage of beer/wine. What are tablets made of? Cautions. What if inhaled? BEST ANSWER: The Mini Oak Wine Barrel Storing & Cleaning Tablets (Set of 5) are made of pre-measured doses of sulfates formulated to kill bacteria and inhibit the growth of yeast and microbes in the barrel. When prepping my 5 ltr barrow do I use hot water or cold. When prepping your wine barell for the first time should it be leaking water continuously? I filled it with hot water and sealed it but it is dripping water will this stop or do I need to refill it with hot water? BEST ANSWER: Thank you for your inquiry. Yes, it will leak water as it needs to be curred. Please empty and rinse several times until you get a good seal. If you have any further questions, feel free to reach out to us at 800 356 8466. Best. Can I know the size of each barrel? BEST ANSWER: Thank you for your inquiry. We have several different sizes. We carry a 1,2,3 & 5 Liter barrel. If you have any further questions, please feel free to contact us at 800 356 8466. Thank you again. how many tablets do you use in the mini oak wine barrel? BEST ANSWER: Thank you for your inquiry. To store or clean your barrel between uses, dissolve tablets in a glass of water. Pour into barrel and top off with water. 1 tablet is needed for each 1-3 liter barrel. Empty and rinse barrel 3x prior to use. If you have any further questions, please feel free to call 800 377 3330. Thank you again. Mini Me not so attractive! May have been better off buying the larger barrel so that the personalization was clear, sharp and more attractive. This is so clever, I want to order more! Service from Wine Enthusiast is rocket fast and packaged neatly. I love looking at their fabulous site and enjoy receiving their catalog. They're the best! I love my wine barrel! I bought this for my husband for christmas this year and he loved it. It was the perfect addition to our "winery" room. Looks great...classy. Haven’t used it just yet, gave it 3 stars cause it did show up quickly. Will add more when I finally use the item.